So this year for Halloween, we are trying to be smart. 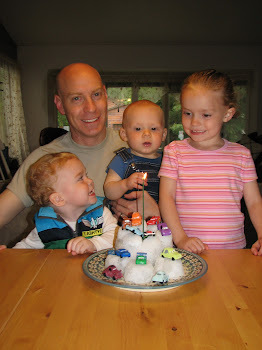 We are trying to be more economical all together as a family and finally get ourselves out of debt. So buying Halloween costumes every year doesn’t save money. I have decided to make Halloween a creativity game! 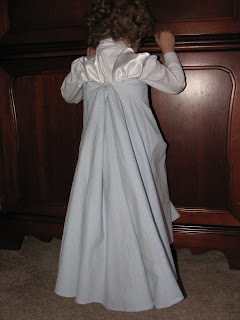 We look all over the house for ideas of different things we want to be, and try to come up with different ideas of things we have to make different costumes, like unused curtains as dresses. Isabelle has her heart set on being Cinderella this year. 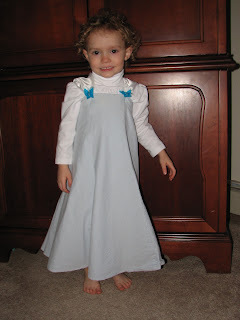 She has never seen the movie but thinks all the pictures of Cinderella are just Gorgeous! 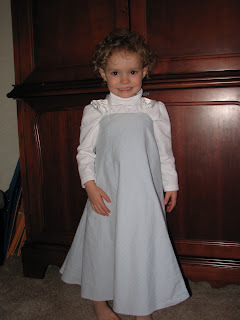 We found a skirt of mine that we are turning into a Cinderella dress. I have the basics of it made all with things that we already have. But I am stuck, so I am asking for any suggestions. I think the back looks good, but the front needs something and for the life of me I can’t make up my mind as to what I should add. So I thought I would get the opinions from others. Please let me know what you think or any ideas you might have! Would adding a crown and jewelry be enough? I don’t have any but I was going to try to come up with a way to make those too. If you have any ideas for those let me know. Do I need larger ribbons, jewels, a sash? What are your thoughts? Oh and I don’t want to do anything too damaging to the skirt, I do plan on wearing it again, so no bedazzling like my husband suggested. Hee Hee! Oh, yeah...Abinadi is probably going to be a Polar Bear; we found a fuzzy one piece outfit that I am going to alter for him. Please, Please, Please, leave comments and let me know what you think! I am in a creativity slump with this dress and Halloween is slowly creeping up! I was totally going for bedazzling! I think that it looks fine with the butterflies, but if you feel it needs something how about a ribbon going across the front just under the breast area! Way cute and creative! I think it looks great too. 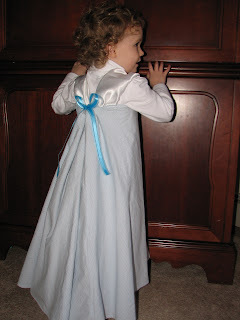 A sash or ribbon around the very top or waist would probably add a little bit without hurting your skirt. Great idea!